Scientists have re-examined an overlooked museum fossil and discovered that it is the earliest member of the titanosauriform family of dinosaurs. 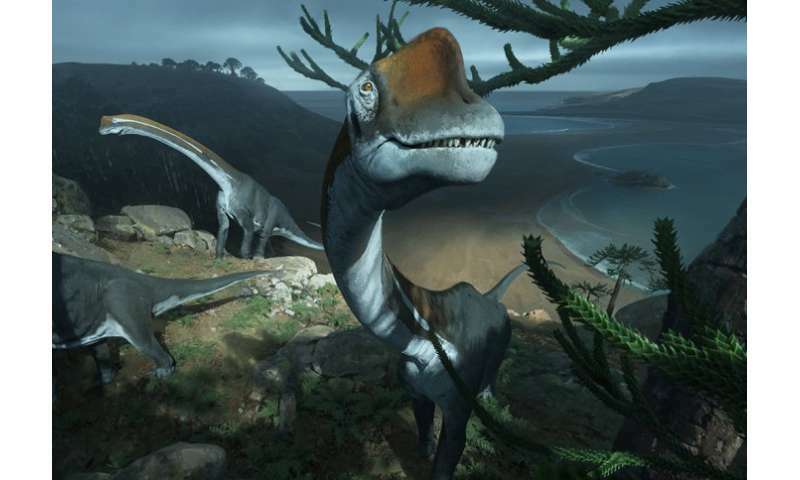 The fossil, which the researchers from Imperial College London and their colleagues in Europe have named Vouivria damparisensis, has been identified as a brachiosaurid sauropod dinosaur. The researchers suggest the age of Vouivria is around 160 million years old, making it the earliest known fossil from the titanosauriform family of dinosaurs, which includes better-known dinosaurs such as the Brachiosaurus. When the fossil was first discovered in France in the 1930s, its species was not identified, and until now it has largely been ignored in scientific literature. The new analysis of the fossil indicates that Vouivria died at an early age, weighed around 15,000 kilograms and was over 15 metres long, which is roughly 1.5 times the size of a double-decker bus in the UK. It had a long neck held at around a 45 degree angle, a long tail, and four legs of equal length. It would have been a plant eater. Dr Philip Mannion, the lead author of the study from the Department of Earth Science and Engineering at Imperial College London, said: "Vouivria would have been a herbivore, eating all kinds of vegetation, such as ferns and conifers. This creature lived in the Late Jurassic, around 160 million years ago, at a time when Europe was a series of islands. We don't know what this creature died from, but millions of years later it is providing important evidence to help us understand in more detail the evolution of brachiosaurid sauropods and a much bigger group of dinosaurs that they belonged to, called titanosauriforms." Titanosauriforms were a diverse group of sauropod dinosaurs and some of the largest creatures to have ever lived on land. They lived from at least the Late Jurassic, right to the end-Cretaceous mass extinction, when an asteroid wiped out most life on Earth. A lack of fossil records means that it has been difficult for scientists to understand the early evolution of titanosauriforms and how they spread out across the planet. The re-classification of Vouivria as an early titanosauriform will help scientists to understand the spread of these creatures during the Early Cretaceous period, a later period of time, after the Jurassic, around 145 – 100 million years ago. The team's incorporation of Vouivria into a revised analysis of sauropod evolutionary relationships shows that by the Early Cretaceous period, brachiosaurids were restricted to what is now Africa and the USA, and were probably extinct in Europe. Previously, scientists had suggested the presence of another brachiosaurid sauropod dinosaur called Padillasaurus much further afield in what is now South America, in the Early Cretaceous. However, the team's incorporation of Vouivria into the fossil timeline suggests that Padillasaurus was not a brachiosaurid, and that this group did not spread as far as South America. The Vouivria fossil was originally discovered by palaeontologists in the village of Damparis, in the Jura Department of eastern France, in 1934. Ever since, it has been stored in the Museum National d'Histoire Naturelle, Paris. It was only briefly mentioned by scientists in studies in the 1930s and 1940s, but it was never recognised as a distinct species. It has largely been ignored in the literature, where it has often been referred to simply as the Damparis dinosaur. Now, a deeper analysis of the fossil is also helping the scientists in today's study to understand the environment Vouivria would have been in when it died, which was debated when it was initially found. The researchers believe Vouivria died in a coastal lagoon environment, during a brief sea level decline in Europe, before being buried when sea levels increased once more. When the fossil was first discovered, in rocks that would have originally come from a coastal environment, researchers suggested that its carcass had been washed out to sea, because sauropods were animals that lived on land. Today's team's examination of Vouivria, coupled with an analysis of the rocks it was encased in, provides strong evidence that this was not the case. The genus name of Vouivria is derived from the old French word 'vouivre', itself from the Latin 'vipera', meaning 'viper'. In French-Comte, the region in which the specimen was originally discovered, 'la vouivre' is a legendary winged reptile. The species name damparisensis refers to the village Damparis, from which the fossil was originally found. The research was carried out in conjunction with the Museum National d'Histoire Naturelle and the CNRS/Université Paris 1 Panthéon-Sorbonne, with funding from the European Union's Synthesys programme. Currently, titanosauriforms from the Late Cretaceous are poorly understood compared to their relatives in the Late Jurassic. So, the next step for the researchers will see them expanding on their analysis of the evolutionary relationships of all species in the titanosauriform group. The team are also aiming to find more sauropod remains from older rocks to determine in more detail how they spread across the continents. More information: The earliest known titanosauriform sauropod dinosaur and the evolution of Brachiosauridae, published in the journal Peer J, 2 May 2017.